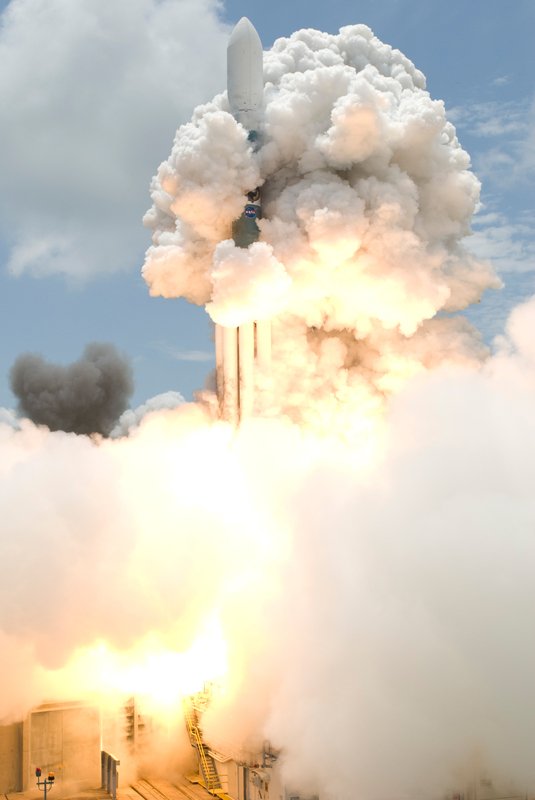 Explanation: Rising through a billowing cloud of smoke, this Delta II rocket left Cape Canaveral Air Force Station's launch pad 17-B Wednesday at 12:05 pm EDT. Snug in the payload section was GLAST, the Gamma-ray Large Area Space Telescope, now in orbit around planet Earth. GLAST's detector technology was developed for use in terrestrial particle accelerators. But from orbit, GLAST can study gamma-rays from extreme environments in our own Milky Way galaxy, as well as supermassive black holes at the centers of distant active galaxies, and the sources of powerful gamma-ray bursts. Those cosmic accelerators achieve energies not attainable in earthbound laboratories. GLAST also has the sensitivity to search for signatures of new physics in the relatively unexplored high-energy gamma-ray regime. What's with the logos on the side? The NASA one is easy enough to make out but what about the ones above it? And would painting that large of a logo on that large of a rocket add to the weight?